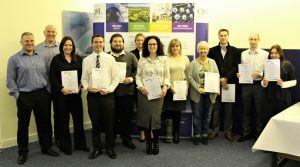 Over the years, hundreds of QSL training delegates have gone back to their businesses fired up with enthusiasm and armed with the tools and knowledge needed for their company to save money, reduce risk and improve quality. This year, we’ve found even more ways to help forward thinking businesses steal an advantage on their competitors or simply ensure compliance with the latest rules and regulations. This month, we’ve been demystifying the new beefed-up version of Data Protection, GDPR, which becomes enforceable on May 25th. After that date, organisations can be fined a staggering 20 million euros for non-compliance with GDPR making our £295 fee for training a delegate on how to protect their business pale into insignificance. If you don’t know where to start with GDPR, you’re not alone. Luckily, our company mantra is about ‘keeping things simple’ so we’ve joined forces with Risk Evolves to demystify the regulation. This ensures that all GDPR training delegates leave with a practical plan of action and the confidence to put together a cross-functional team to ensure long-lasting compliance. If your organisation isn’t GDPR ready, join our next training course. Or, if you’re a high risk organisation which keeps lots of customer data, such as health care providers or estate agents, contact us about our bespoke training.